The Loneliest Guy (live, 2003). The Loneliest Guy (Parkinson, 2003). The Loneliest Guy (live, 2004). This type, a man cooped in his room and subsisting on art and memory, is a constant in Bowie’s writing. Go back through the songs and his sad face keeps turning up. The failed artist/academic who lives above an Austrian grocer; the man who carries a razor in case of depression; the coked-up magus trapped in his circle, overlooking the ocean; the assorted shut-ins of Low, like the girl with grey eyes and the man in the electric blue room; old Algeria Touchshriek. If one end of the Bowie spectrum is the charismatic on stage, the “Loneliest Guy” is the other: Bowie’s deep ultraviolet range. An isolate, a man unable to communicate, to get out of his head; one who expires for lack of an audience. So “The Loneliest Guy” sloughs off an old self, or does it? The man who said everything was in its place, who was utterly content, was perhaps projecting a bit. The “loneliest guy” here flicks through old pictures on his hard drive, poisoned by brighter memories (“the notion that our ideas are inhabited by ghosts and that there’s nothing in our philosophy—that all the big ideas are empty containers” (see “Reality”)). Had he really been boxed up at last? If so, what would it mean for Bowie’s songwriting, when the self closest to his muse was no longer in service? This wasn’t really true about Brasilia. 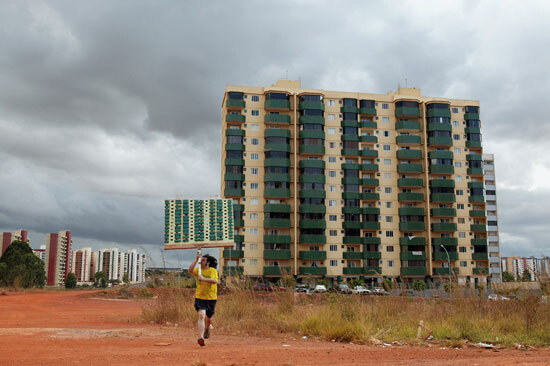 * It suggested more Bowie’s old rotting Hunger City, the modernist grid turned dystopian playground, or the capitalist wasteland of “Thru’ These Architect’s Eyes.” This aside, the metaphor of a rotting Brasilia, a great modernist plan being eaten by nature, works as a description of the track itself. “The Loneliest Guy” is a song collapsing from within, moving as if sleep-stung, occasionally rousing to life, then guttering out again. Take how its remote E-flat minor key is woken by bright intrusions from E major (“steam (E) under floor (Ebm)”). The song yearns to pull free in its third verse (“all the pages that have turned...”) until a Eb minor chord snuffs out the coup (on a precisely-timed “oh”). It’s such a lugubrious song, and Bowie’s character is such a colossal sad sack, that its miseries border on the darkly comical. It calls to mind Steve Martin’s The Lonely Guy, set in a New York where lonelyhearts congregate on city roofs to holler their exes’ names, who eat dinner alone with a spotlight trained on them and who politely queue on the Manhattan Bridge to jump into the East River. Flavored by waves of David Torn’s atmospherics (it’s possible Bowie thought of the Pretty Things’ “Loneliest Person,” built on arpeggiated acoustic guitar), the song was built on Mike Garson’s piano. During the Reality sessions in New York, Garson played Yamaha digital piano (owned by Bowie, and loaned to Garson during the 2003-04 tour), then went home to California with the MIDI files to re-cut his parts on “my 9-foot Yamaha Disklavier, recording as [the MIDI] played back,” Garson recalled to Mix. So at mixing, Bowie and Visconti could choose between “synthetic” or “real” Yamaha on each track and picked analog for this one. It was one of the most gorgeously-recorded of the Reality tracks, with the guitars serving as a string section, Garson’s chords resounding into deep space and Bowie hanging upon every note he sings, as if he can’t bear to let them go. Recorded: (lead guitars, lead and backing vocals, overdubs) March-May 2003, Looking Glass Studios, New York; (piano) ca. March-April 2003, Garson’s home studio, Bell Canyon, CA. Released 16 September 2003 on Reality. * As per the 2010 IBGE census, over 2.4 million people live in Brasilia, making it the fourth-largest city in the country. Top: Konstantin Maximov, “Copenhagen,” 2003; Jordi Colomer, Anarchitekton: Brasilia (2003).